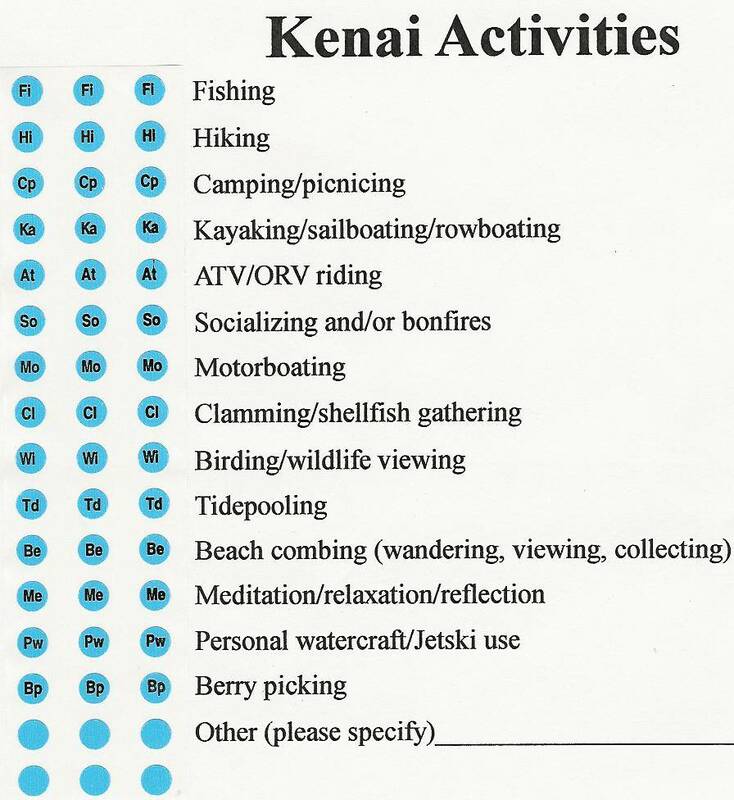 This method of mapping provides participants with a map of the study area and sticker dots (or markers) to identify landscape values, special places, development preferences, activities, or any spatial attribute of research interest. Key considerations for mapping success include map quality and map scale, easy to place markers, and clear and understandable instructions. The image on the left shows 4 unweighted sticker dots representing 13 values. 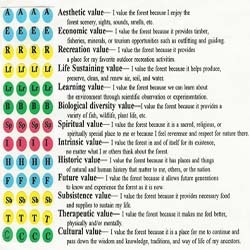 Other studies have also used weighted sticker dots where each landscape value is given an importance rating or weight such as 50, 25, 10, or 5. Internet-based mapping uses a web interface that records landscape values or other important attributes (e.g., activities, experiences, threats, facilities needs) on a displayed map image. The point locations of the values are recorded in a database. 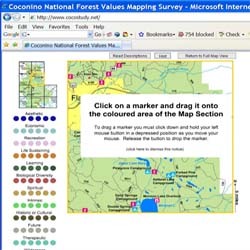 The first internet-based landscape values mapping application was developed by Dr. Jen Beverly and colleagues at the Canadian Forest Service to inform fire policy for Crown lands in Canada. The application used Adobe "Flash" and PHP/mySQL software. Additional internet applications using the same method were completed on three national forests in the U.S.--the Coconino National Forest, the Deschutes and Ochoco National Forests, and the Mt. Hood National Forest. The Parks Victoria (Australia) Alpine Region study also used a Flash-based PPGIS system. Google Maps and Google Earth PPGIS applications represent the 2nd generation of internet-based PPGIS systems. These PPGIS applications used the Google Maps/Earth application programming interface (API) and offered the advantage of public familiarity, more flexible map navigation (zoom, pan), and multiple map views (e.g., map, satellite, terrain). The first Google Maps PPGIS application asked residents of Grand County, Colorado, to identify ecosystem services. A second Google Maps PPGIS application was developed collaboratively with The Nature Conservancy and asked Wyoming residents in 3 rural counties to identify different landscape values and attributes. This method asks participants to draw polygons (or points) on maps to indicate landscape values and special places. The drawing of participant polygons is usually (and best) done under the supervision of a trained researcher conducting an interview with the participant about the qualities of the study region and the participant's identification and attachment to the region. Researchers at the Aldo Leopold Wilderness Research Institute have successfully used this method to map values related to wildfire policy. See interview mapping protocol here. 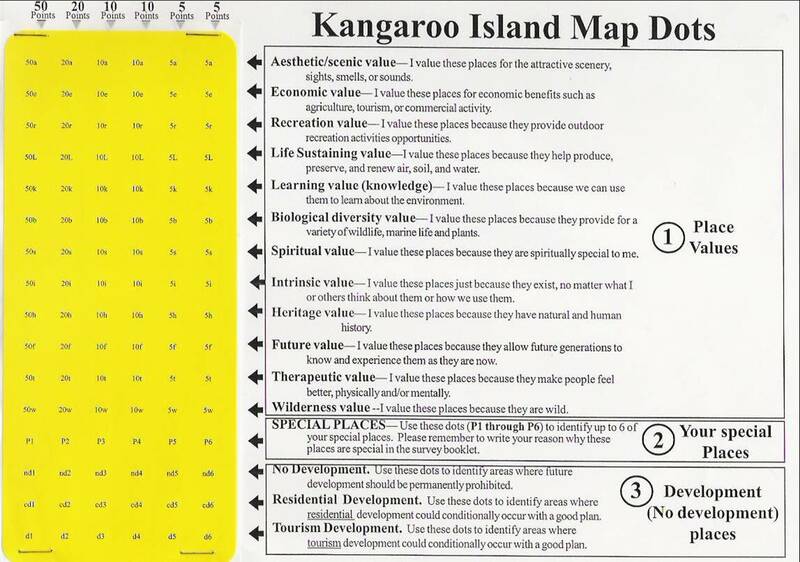 Another good example is the mapping of marine and coastal values using stakeholder interviews. One of the largest studies was done for the Kimberley Region in Australia. See study report here. Polygon mapping can also be done with conventional mail survey techniques using a polygon map legend that color-codes the various landscape values. 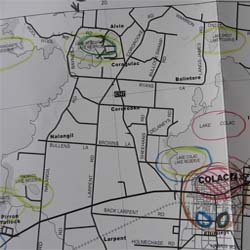 The map image to the left shows a respondent map using this method where the respondent was provided with a set of colored pencils to draw the polygons. Research has been completed that evaluates the consistency in PPGIS responses between point and polygon mapping methods. View the publication here. 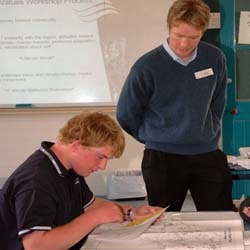 This method involves inviting participants to a workshop where participants complete a mapping exercise by following instructions provided by the workshop facilitator. This method can use any of the methods described above--paper or computer-based GIS. Chris Raymond, a former social science researcher with the South Australian government, has used the workshop method to have participants map both landscape values and potential landscape changes due to climate change in South Australia. This method involves inviting local and/or indigenous people to a convenient location where participants are asked to engage in a mapping activity. The methods of mapping can vary considerably but simple methods such as drawing polygons or points on aerial photographs works quite well. Important principles for the mapping of indigenous knowledge include local ownership of the spatial information and protection of sensitive locations. 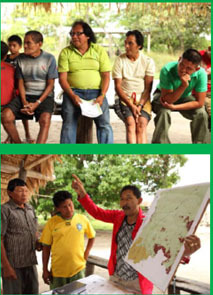 Sara Ramirez, together with a team of Conservation International Suriname, are facilitating the mapping of subsistence, livlihood, cultural, and recreation values with Amerindians in Suriname, South America. 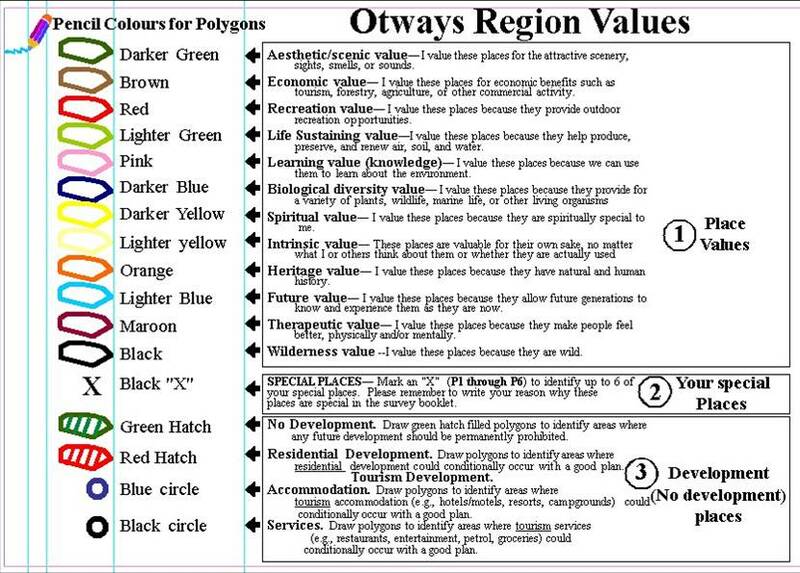 With the help of Sipaliwini villagers, she produced a poster of landscape values to share with the villagers. A paper that describes the participatory mapping process in Suriname in detail is available for download here.